In the early 1960s, Ackermann had been an expert witness during the hearings of the International Court of Justice (ICJ) in The Hague about the dispute between Cambodia and Thailand on ប្រាសាទ​ព្រះវិហារ Prasat Preah Vihear, the most spectacularly situated temple built during the six-centuries-long Khmer Empire. 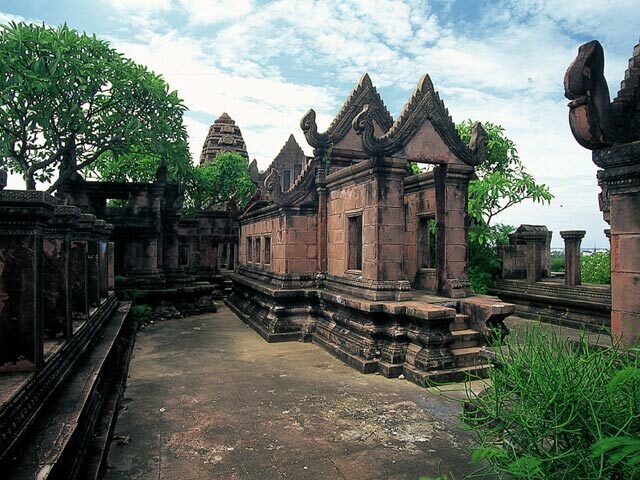 Besides the city and temples of old Angkor, especially Angkor Wat, Prasat Preah Vihear is arguably one of the most important ancient buildings in Cambodia today. 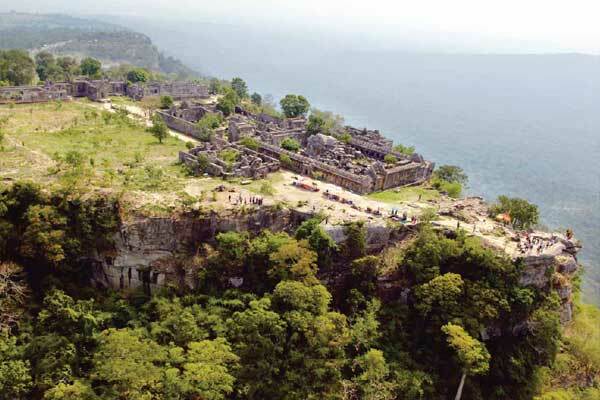 But situated atop a 525-metre (1,722 ft) cliff in the Dângrêk Mountains in Preah Vihear province, it is also the site of a lengthy dispute between Cambodia and Thailand over ownership. In 1962, the International Court of Justice (ICJ) in The Hague ruled that the temple, which is called ปราสาทพระวิหาร Prasat Phra Wihan by Thais, belongs to Cambodia. 55 years ago, in June 1961, the German engineer and specialist in the field of geodesy, Friedrich Ackermann, was assigned by the Delft Institute of Aerial Surveys in the Netherlands to determine the actual watershed line in the Preah Vihear area. Spending ten days on the promontory of Preah Vihear, and using sketches, measurements and point elevations, Ackermann was indeed able to determine the correct flow direction of a small rivulet and the non-existence of another streamlet marked on an obviously erroneous 1907 French map. The real watershed, stipulated as the border line in the Franco-Siamese treaty of 1904, would have left another Khmer temple complex under Thai sovereignty. During the hearings of the ICJ, the young German scholar was cross-examined by Dean Acheson, the chief lawyer of the Cambodian side. The 1962 ICJ verdict in favour of Cambodia was not due to, but rather in spite of, Dr. Ackermann’s crucial findings because the exact watershed was not considered decisive by the majority of judges who insisted on the Thai tacit acceptance of the formerly submitted French map. In 2013, when the ICJ specified the “vicinity of Preah Vihear” wherefrom Thai military and police forces had to be withdrawn, the then 83-year-old Professor Ackermann took a plane to the Netherlands to listen to the arguments put forward by the experts working in Thailand’s legal team. Friedrich Ackermann is in fact one of the very few witnesses of the 1962 ICJ trial still alive today. Therefore, as the HGT writes in their invitation, “his personal recollections represent extraordinary and unique resource for understanding the Preah Vihear temple dispute between Thailand and Cambodia”. The lecture will be held in English on Tuesday, 21 June 2016, 18 Uhr c.t. (6.15 pm s.t.) at the Asien-Afrika-Institut of the University of Hamburg, Edmund-Siemers-Allee 1, Ostflügel, Room 232. Prof. Dr.-Ing. Dr. E.h. mult. Friedrich Ackermann (* 1929) is an internationally renowned professor, researcher and developer of analytical and digital photogrammetry. He founded the Institute of Photogrammetry at the University of Stuttgart 1966 and remained its director until 1992. He has received numerous international awards and has been appointed an honorary member of the British, American, and international societies of photogrammetry.